Developed by Holbein to offer the same high pigment quality and archival characteristics of Holbein's Artists' Oil line while allowing soap-and-water cleanup, Duo Aqua Oils are characterized by rich hues, high chroma, excellent resistance to light, and 17 "Elite" colors that contain heavy metal pigments such as quinacridones, cadmiums and cobalts. Holbein Duo Aqua Oil Colors can be diluted with water, which creates a "melting" effect. A unique surface active agent helps them dry faster than traditional oils, allowing work to be completed in a shorter period of time. Holbein Duo Aqua Oils can be mixed with acrylics, watercolors, gouache, and oils, to create a variety of effects and make possible a variety of techniques. They can even be mixed with metallic and pearlescent watercolors to create colors that do not normally exist in oil color palettes. Duo Aqua Oil Colors are no longer watersoluble when mixed with more than 30% traditional oil color. Because they clean up with soap and water instead of harsh solvents, Duo Aqua Oil Colors are safer than traditional oils for use in the studio or classroom. Note — Holbein's five "Luminous" colors should not be considered permanent. They will degrade with exposure to ultraviolet light. The lifespan of such works can be expanded greatly if they are shielded from ultraviolet light. Assorted Set of 12 — This set contains 11 colors in 20 ml (.68 oz) tubes, including Cadmium Red Deep Hue, Vermilion Hue, Lemon Yellow, Yellow Ochre, Cadmium Yellow Light Hue, Cadmium Green Light Hue, Cadmium Green Hue, Ultramarine Light, Cobalt Blue Hue, Burnt Sienna, and Ivory Black. The set also includes a 50 ml (1.69 oz) tube of Permanent White. 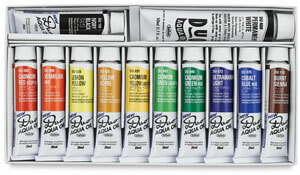 Compact Set — A great choice for plein air painting, this set contains 10 Duo colors in 10 ml (.34 oz) tubes including Cadmium Red Deep Hue, Vermillion Hue, Cadmium Yellow Light Hue, Cadmium Green Light Hue, Cadmium Green Hue, Cobalt Blue Hue, Yellow Ochre, Burnt Sienna, Ivory Black, and Permanent White. 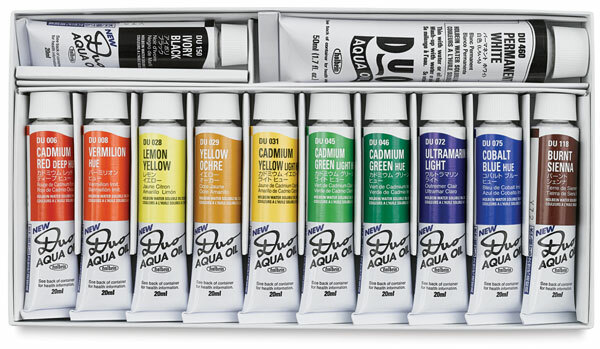 Starter Set — If you're curious about trying Holbein Duo Aqua Water Soluble Oils, this set is a great way to start. It contains 12 colors in 10 ml (.34 oz) tubes including Cadmium Red Deep Hue, Vermilion Hue, Lemon Yellow, Cadmium Yellow Light Hue, Yellow Ochre, Cadmium Green Light Hue, Cadmium Green Hue, Cobalt Blue Hue, Ultramarine Light, Burnt Sienna, Ivory Black, and Permanent White. Color and Linseed Oil Set — This set contains 10 Duo colors in 10 ml (.34 oz) tubes including Cadmium Red Deep Hue, Vermilion Hue, Cadmium Yellow Light Hue, Cadmium Green Light Hue, Cadmium Green Hue, Cobalt Blue Hue, Yellow Ochre, Burnt Sienna, Ivory Black, and Permanent White, plus a 40 ml (1.4 oz) bottle of Duo Water Soluble Linseed Oil, which increases transparency and gloss while still allowing for soap-and-water cleanup. Color and Quick Drying Medium Set — This set offers the artist a wide-ranging palette of 18 Duo colors in 20 ml (.68 oz) tubes including Alizarin Crimson, Cadmium Red Deep Hue, Vermilion Hue, Jaune Brilliant, Lemon Yellow, Yellow Ochre, Cadmium Yellow Light Hue, Viridian Hue, Cadmium Green Light Hue, Cadmium Green Hue, Cerulean Blue Hue, Ultramarine Light, Prussian Blue, Cobalt Blue Hue, Mauve, Burnt Umber, and Burnt Sienna, plus a 50 ml tube of Permanent White. Also included is a 50 ml (1.69 oz) tube of Quick Drying Medium Gloss Paste, which adds body and imparts a transparent gloss finish while dramatically accelerating drying time. Elite Set — Traditional pigment paints, including real cadmiums and cobalts, are brought together in this set of 12 Duo colors including Spinel Black, Anthraquinone Red, Cadmium Red, Yellow Ochre Natural, Cadmium Yellow, Phthalo Green, Cadmium Green, Cobalt Blue, Ultramarine Deep, Phthalo Blue, and Imadazalone Brown in 20 ml (.68 oz) tubes, plus a 50 ml (1.69 oz) tube of Permanent White.